Calling all students, teachers, office heroes, trivia fans and lifelong learners! Whether you feel creative, want to learn something new or are up for some fun and competition – get Kahoot!’ing anywhere, anytime! Be a game designer, host or player! Which of these hats will you wear today? Become a quizmaster anywhere, anytime! See how this teacher of awesome and his students use our app and challenges to make homework awesome. Beautifully played! NB: To use challenges for remote training in your company, you need a premium subscription to Kahoot! for businesses. Log in to your Kahoot! account on your computer or in the mobile app by clicking on the profile icon in the top left corner. Open a kahoot you like. On your computer, click Challenge. In the mobile app, tap Play and choose Challenge. Decide for how long the challenge should be live and set the deadline. Copy the challenge link and share it by email, via messengers, on Google Classroom, Remind, by email, etc. You can also share the PIN of the challenge. Open the Kahoot! app and tap Create. Add a title, description, cover image, and tweak visibility options. Tap Add question. 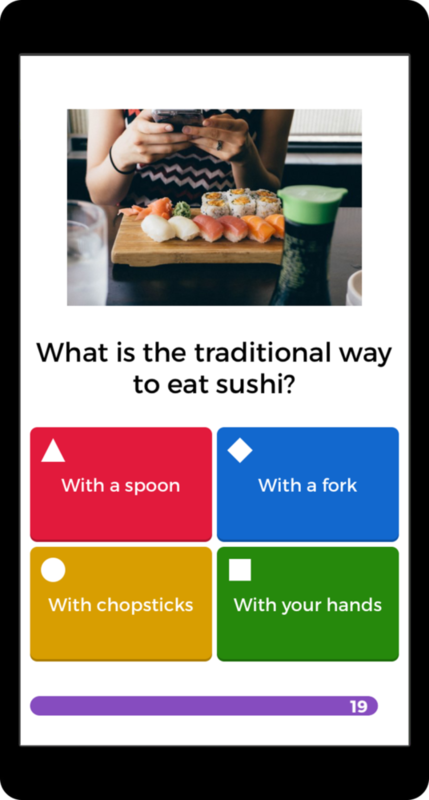 Add the question and answer options (tap the colored tiles), toggle correct and incorrect answers. Change time limit and add images or video. Add more questions, and check progress against our Question checklist and overall Kahoot checklist. Tap Done – it’s ready to play! Apple, the Apple logo, and iPhone are trademarks of Apple Inc., registered in the U.S. and other countries. App Store is a service mark of Apple Inc. Google Play and the Google Play logo are trademarks of Google Inc.